You are what you eat. According to Andrew Newberg and Mark Robert Waldman, authors of How God Changes Your Brain, your brain is only as healthy as your best spiritual practice or worst God -image. In short, the book is all about the nexus of God and science as seen in the human brain, and how that coming together can affect and transform our lives. And the research presented is a stirring case for how "God," i.e., our spiritual practices and religious faith, can affect the life and health of our brain, for good or ill. The first part of the book is a primer of sorts. We learn the function of each part of the brain. There are certain "God" circuits where perception of God is formed. The amygdala is implicated in creating the reptilian brain and the fight or flight response. The frontal lobe's job is to logically think about God. The striatum helps to control the amygdala, allowing us to know safety and a sense of well-being in God's presence. The thalamus is the key organ that makes God feel objectively real. 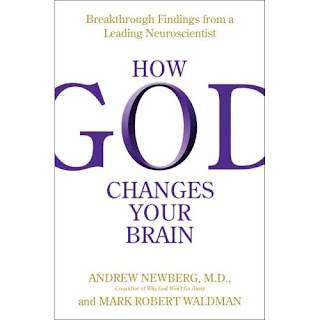 This book has much to caution about unhealthy brain-faith, a persistent theme.The more our faith is fear and anger based, the more damaging it is for our brain: "...the problem arises when individuals use their religion to justify angry feelings toward others. Specifically, expressing or listening to angry thoughts can disturb the normal neural functioning of many parts of the brain. In fact, just reading emotionally evocative words stimulates...in ways that resemble traumatic coding." For me the best quote is: "As doctors, we have come to realize that people need to deal with their spiritual pathology in addition to their physical and mental concerns." The real meat of the book seems to be the long list of exercises that not only contribute to brain health, but overall well-being and serenity. The reader is reminded that it's regular practice of any and all exercises that bears the most fruit. Yawning and "deep yawning" are listed separately in case you find brain health boring. And there is a separate chapter for "compassionate communication." Even minimal religious participation supports greater longevity and health. Meditation, even the kind that is unrelated to faith, can permanently strengthen the parts of the brain that are responsible for lowering anxiety and depression, and enhances empathy and intellectual functioning. There are some who would find this topic unnecessary: after all, do people of faith really need medical evidence to motivate them in adopting certain spiritual practices? On the other hand, why wouldn't we want to know how our faith affects our brains, especially if it complements health? It was St. Paul who spoke of the "renewing of your minds" in Romans 12. In light of this volume, we have to ask ourselves, how is the spiritual life we have chosen contributing to- or hindering- that renewal of mind? So, does the book say that God and the benefits of faith are reduced to brain chemistry? Or does the book suggest that our brains simply enjoy a real God? I think the book was more about how beliefs and practices affect brain health. It didn't try to prove God or say that the benefits are chemical only, because there was a real emphasis on practicing non-violent communication and serenity in relationships. Are there any parts of the book that address ways the brain processes faith-based learning or how the brain absorbs and adapts to spiritual practices? The book did discuss the impact various spiritual practices have on brain function. It also covered different kinds of belief, like hate, judgmental, love, acceptance, etc. as stimulating different parts so the brain. Hate and fear stimulate the more primitive brain whereas love and forgiveness are higher functions of the human brain It was very interesting. It did not go into how faith itself is absorbed or learned. But the faith development literature does touch on cognitive growth as you know. Thanks for reading and commenting!